CREATING EFFICIENCY AT PORT GATE: Reservation system also benefits trucking companies. Federal money will be used to help the Port of Virginia develop a reservation system for motor carriers. Reservation system will allow port to meter the flow of traffic in and out of terminals. The Port of Virginia’s focus in driving efficiency at its truck gates is being supported by the federal government through a specialized grant program that is focused on reducing congestion by better use of technology. 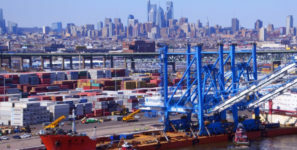 The Federal Highway Administration (FHWA) announced that the port will be receiving an Advanced Transportation and Congestion Management Technologies Deployment (ATCMTD) grant of $1.55 million. The money, along with equal matching funds from the port, will be used to help the port continue its work on the development and phased implementation of a reservation system at its terminals for motor carriers. “We are focused on expanding our terminals, growing our volumes and creating efficiencies across every phase of our operation,” said John F. Reinhart, CEO and executive director of the Virginia Port Authority. “As we go forward, a reservation system for motor carriers is going to be absolutely necessary to creating efficiency at the gate, in the stack-yards and improving service. It will allow us to meter the flow of traffic in and out of our terminals, level-out out the rush hours and give us more control of the flow of cargo moving by truck. The ATCMTD program funds cutting-edge technologies that are ready to be deployed to enhance existing traffic capacity for commuters and businesses. For more than two years, the port has been working with several regional trucking firms in development of its reservation system. The system is being tested, but there is no deadline for implementation.